Choosing the best footwear will be one of the most crucial decision while preparing for hiking. A lightweight, waterproof and comfortable hiking boots can keep your foot nimble in the wild outdoors. A good quality hiking boot has a tougher, waterproof, and durable construction with less unsupported mesh. They are often made with a leather and textile combo. Usually, having a more rigid and stiff sole, they will last longer and you won’t feel the rocks under your feet. 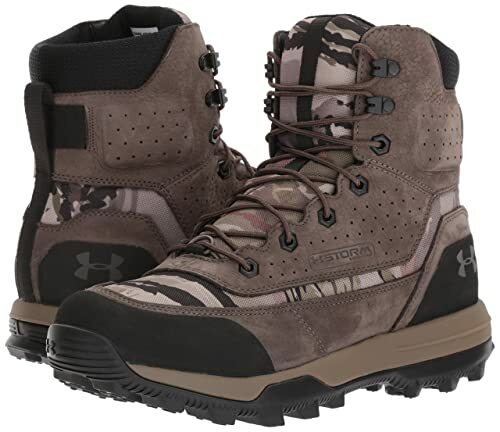 Considering the above-mentioned features, here we are recommending you the Men’s SF Bozeman 2.0 Hiking Boot by Under Armour. We have discussed the unique features of these hiking boots along with the pros and cons. Comfort is the most essential feature of a hiking boot. If you don’t feel comfortable, you will feel pain in every step! So, find what your feet feel happy. The Bozeman 2.0 hiking boots will be the most comfortable boots you have ever owned. They are lightweight, durable with good traction. They are insulated and a good option for mild to moderate cold. If you wear a good pair of boot sock, they will fit great and you will the feel ultimate comfort during extreme condition. The SF Bozeman 2.0 also features UA Scent Control lining with Cupron copper infused sock-liner top cover. This anti-odor technology prevents the increase of odor-causing microbes. These boots have superior ankle support too. It features waterproof nubuck leather and textile upper for lightweight support. The SF Bozeman 2.0 also incorporates Under Armour’s Storm Waterproof membrane technology for superior protection. When you hike on trails, your feet sweat a lot. If that moisture doesn’t get out, it will make your foot skin soft and prone to blisters. This unique UA waterproof membrane repels water without sacrificing breathability. Its lightness and flexibility make them a good option for hiking, camping, or hunting. Besides, Its high-traction rubber lug outsole also offers admirable traction in variable terrain. The outsoles provide excellent grip & stability that keeps you covered in the wilderness. Weight is another crucial consideration for hiking boots. The pro hikers always refer lightweight hiking boots over heavy backpacking boots. Weight is a really big deal to keep your feet nimble on the trail. Lightweight boots help avoid the knee and hip flexor problems. The SF Bozeman 2.0 weighs about 2.8 pounds per pair. So, these are very lightweight and comfortable boots. These boots also feature lightweight EVA midsole for optimal cushioning. It is both comfortably-cushioned and quite stable. These boots are going to be a perfect gear for your next hiking adventure. Q: Do they keep you warm? A: They are insulated and rated for mild to moderate. Q: What is the height of this hiking boot? A: For the most part but for wide feet, you might have issues. As you have already read the article and made your decision. Now you can keep your feet dry, concealed, and comfortable in trails with the UA SF Bozeman 2.0 Hunting Boots. These boots will be an excellent option over uneven, shifting terrain to help you keep moving. Here, we have tried to provide you with detail information. We hope this review helped you in your purchasing decision!!! And if you found this useful article, please share your experience with your friends!